An aerodynamic smooth style that reduces drag to improve gas mileage is what the Lund Genesis Elite snap tonneau cover is all about! An affordable snap tonneau cover with rag top style fabric for awesome looks and durability. The Genesis Elite snap cover comes ready to mount onto your truck bed using durable clamps. Utilizing a heavy duty aluminum frame with removable bows, this cover will last you a lifetime. With a durable snap construction, the snap cover will stay secure. In addition, the patented insulsnaps will provide alignment. This style of tonneau allows for you to rollup the cover and remove the bows when you need to use your truck bed for hauling, plus when needed you can just unsnap one corner for quick access. Manufactured from an extra durable, premium HAARTZ twill weave fabric, which looks like a rag top convertible fabric, the Lund Elite snap cover looks amazing compared to other tonneau. The resilience of the twill fabric will last for years. Plus the seals includes with the cover, help keep out any water, dirt, and debris from your truck bed. Purchase the Lund Genesis Elite snap tonneau cover not only for its premium twill fabric or for its sleek and stylish black color, but also for all of the snap covers other awesome features! Easy at home installation. No drilling is required. 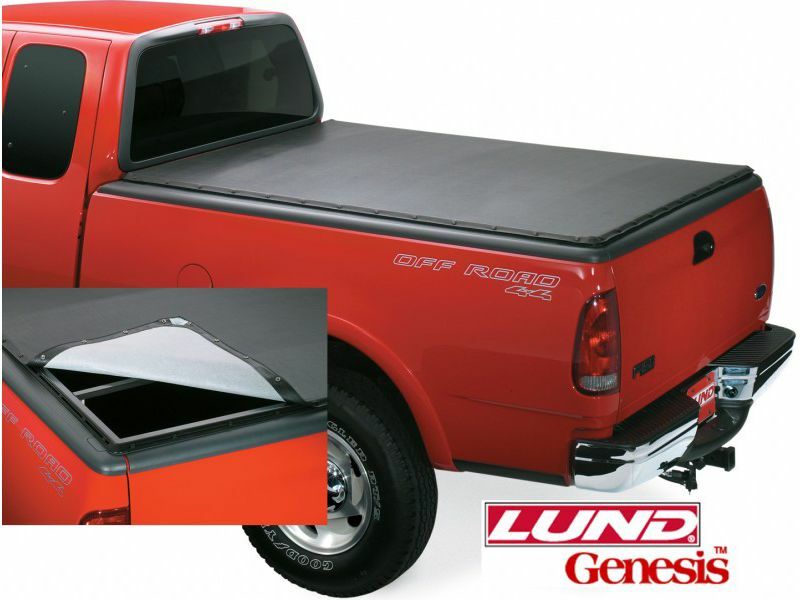 The Lund cover installs to your truck bed with clamps. For additional information, please call toll free 1-877-216-5446 or 701-253-5906.